Reform Judaism - Shemesh summer camps: don't miss out! BlogHome » News » Shemesh summer camps: don’t miss out! Shemesh summer camps: don’t miss out! Recruitment for RSY-Netzer’s famous Shemesh summer camp is in full swing! Shemesh is a wonderful experience for young people to spend an extended period of time in a nurturing, friendly, Reform community, so don’t miss out! Atid (age 15) – Our under canvas camp with a 3 day hike! As the Zionist youth movement for Reform Judaism, RSY-Netzer want to make sure as many young members of our communities have the opportunity to join them on Shemesh – so make sure to get your applications in before camp fills up! Emunah (year 8 camp) is more popular than ever this year, so apply soon to secure your place if you’re interested in this particular year group. RSY-Netzer camps create a Jewish environment unlike any other, allowing chanichim (participants) to explore different ideas, discover their passions, tackle challenging questions and of course, make lots of friends. With a summer that’s full of adventure, interesting and engaging learning, fun-filled days and nights spent with friends, what’s not to love?! RSY-Netzer can’t wait to see you on Shemesh this summer! With all of our events we offer financial assistance to try to ensure that means is not a barrier to those who’d like to be a part of RSY-Netzer. 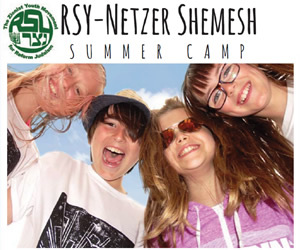 If you’d like any more information about Shemesh you can find out more at the RSY-Netzer website.